Subway’s struggles have made recent headlines. The world’s largest submarine sandwich chain has reintroduced the $5 footlong to try to take back market share after losing 355 stores in 2016, and seeing foot traffic decline 25% over the past few years. There’s a much more dramatic decline in the sandwich world, however, that has gotten much less media attention. 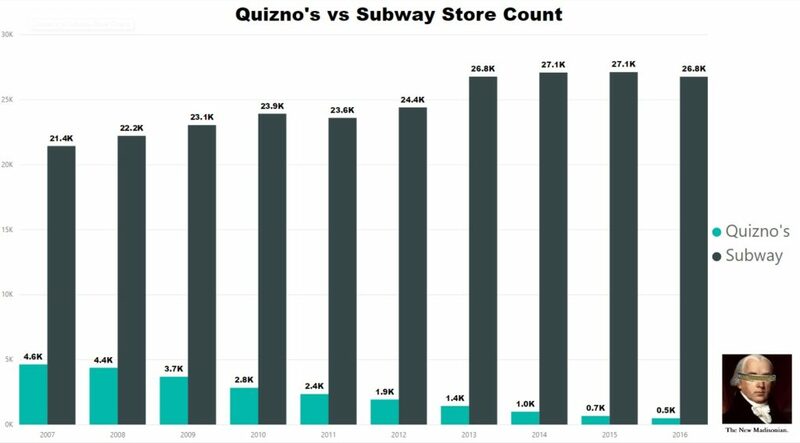 The rapid fall of Quizno’s Subs is one of the biggest restaurant failure stories of the 21st Century. Quizno’s saw amazing growth in the late 90’s and early 00’s. From a mere 103 restaurants in 1995, Quizno’s grew to over 4,600 restaurants by 2007. On average, the chain was adding about 375 new restaurants per year. It wasn’t sustainable. From 4,600 stores in 2007, Quizno’s was left with a mere 488 restaurants remaining by the end of 2016. 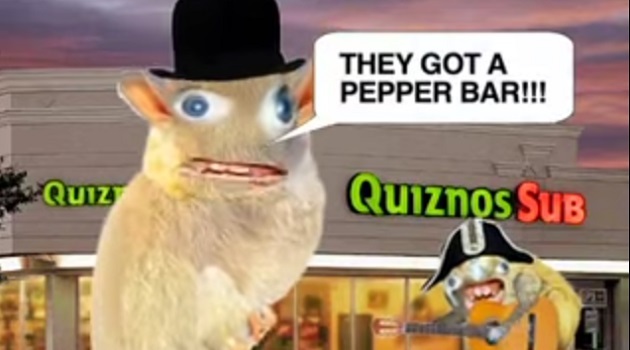 In other words, roughly 90% of the Quizno’s from 2007 are no longer around. That’s quite a precipitous decline. Subway’s recent troubles are a tiny blip compared to the collapse of its former biggest rival. Quizno’s struggles are rooted in terrible business practices that harmed its franchisees. For years, Quizno’s charged too much for ingredients, with franchisees complaining they had to deal with significantly higher costs than competing sandwich chains. These issues have only been exacerbated by the rapid rise of the “better sub” chains such as Firehouse Subs, Jersey Mike’s, Jimmy John’s, and Which Wich. 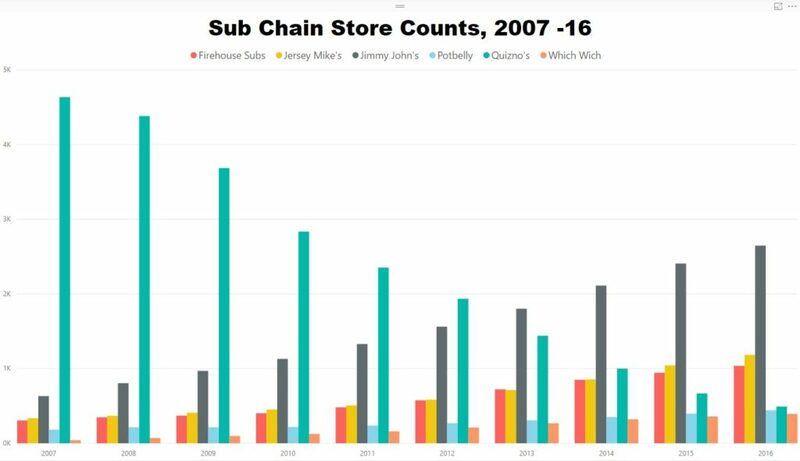 In the chart below, we can see that Quizno’s used to led the pack among this group, but now lags far behind Jimmy John’s, Jersey Mike’s, and Firehouse Subs. Potbelly and Which Wich have likely overtaken the chain as well by the time of this writing (Jan 2018). 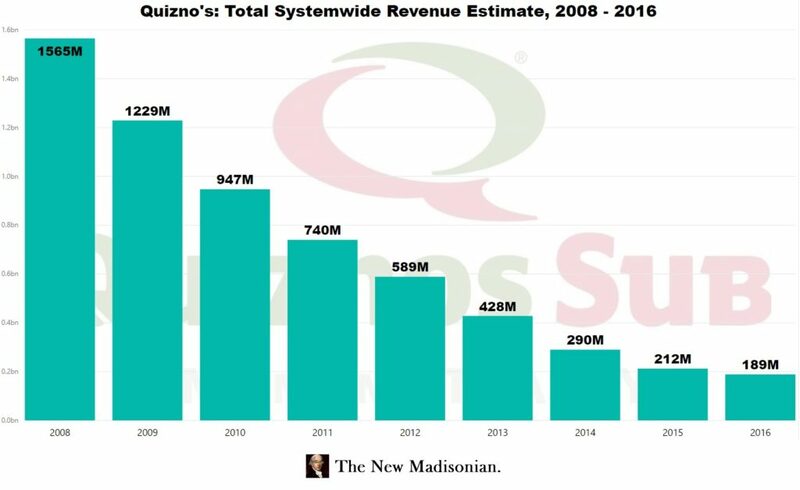 Quizno’s system-wide revenues have plunged from an estimated $1.6 billion in 2008 all the way down to around $200 million in 2016. 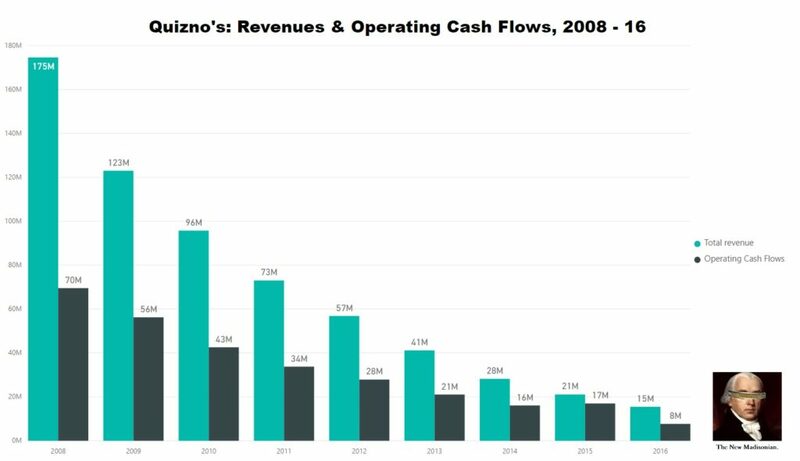 Revenues and cash flows for Quizno’s US corporate have likewise plunged, with operating cash flow falling from $70 million in 2008, down to a mere $8 million in 2016. Quizno’s decline is rooted not only in high ingredient costs, but also a significant revenue decline. Revenues on a per store basis declined an estimated 31% from 2008 to 2014. There is good news in the chart below, however. 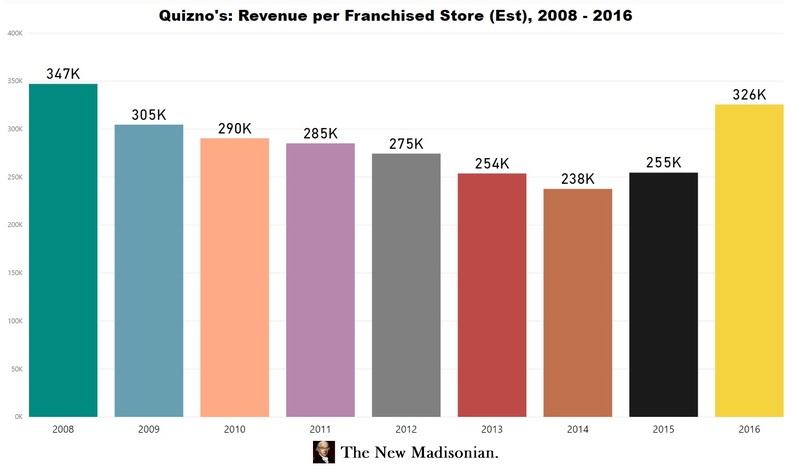 While Quizno’s store count has continued to fall, its average revenue per store appears to be back on the rise since 2014. 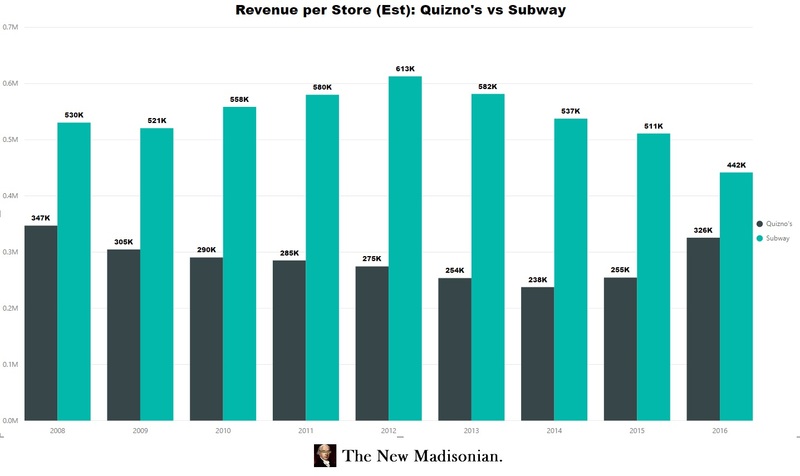 Quizno’s has even started to close the gap with Subway on a revenue per store basis; albeit, it still has a long way to go. Quizno’s filed for bankruptcy in 2014 and has a new ownership team. At least the signs are that they’ve made the stores more competitive. However, it’s easy to forget that for franchisors like Quizno’s, there are two customers: the people who eat the sandwiches and the people who become franchisees. The sandwich lovers are starting to come back. Can Quizno’s new ownership start to convince potential franchisees that the water is fine? That remains to be seen, but it’ll be an interesting story to track over the next several years.